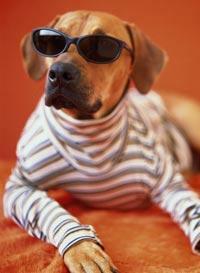 WMDHM: Greatest Hits of the Dog Dressing Phase | Will My Dog Hate Me? I had no clear idea of where I wanted to be, so it’s kind of unrealistic to beat myself up for not being there. It’s a bit like saying, I’m only in California, not very far from Arizona, when I didn’t save up for a trip to Paris or book a flight. I’ve done what a vast majority of beginning bloggers don’t manage to do: lasted a year. I’ve been invited to speak at BlogPaws, the first pet blogger’s conference — coming up this weekend! — which suggests some pretty impressive people have been reading this blog. So I’m thinking I’ve been doing something — or at least some things — right. And that’s a good basis for vowing to do better next year and, especially, to hone my focus. If any regular readers have some thoughts about what they’d like to see more of (or less of) here, I’d love to know. 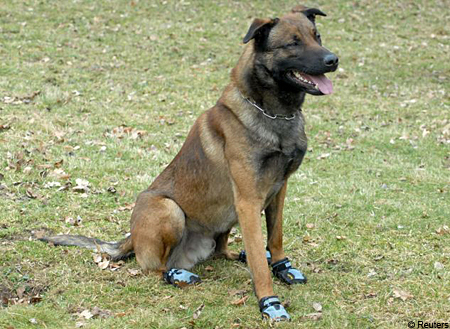 Germany’s Finest: Dogs In Blue (Shoes) celebrates the police dogs of Dusseldorf, tasked to patrol the streets of the city. Japanese Dog Dressing, Part 1 features DIY costumes and cute dogs. I think I could have devoted my entire blog just to dog fashion in Japan. Giving Dog Couture a Bad Name is pretty self explanatory. Even Leona Helmsley didn’t make her pup, Trouble, don a diamond tiara. My dog sunglasses series was a lot of fun… so much so that I’m choosing two posts to represent it: Sunglasses: Fashion Accessory or Dog Necessity? Part 1 and CATs for Dogs. Finally, my rationale for being able to highlight dog dressing in the first place, the still very timely Well, If the ASPCA Says It’s Okay…. It heralds what turned out to be the first of an annual Go Orange Photo Contest to create awareness for April Prevention of Cruelty to Animals Month. Check it out, enter — and look at last year’s winners. They’re a hoot. Congratulations on your blog’s one year anniversary! Thanks, Kate! As for your request — just as soon as I get a new camera and really learn how to use it, you’ll be inundated with Frankie photos! Congrats on your one year blogiversary! Congrats on your first year and well done with being chosen to speak at Blogpaws. Hope you have a great time! Thanks for all your good wishes! A year is a long time in this biz. You’re right, a lot of people fold their laptops and quit early on. Congratulations. And see you at BlogPaws. 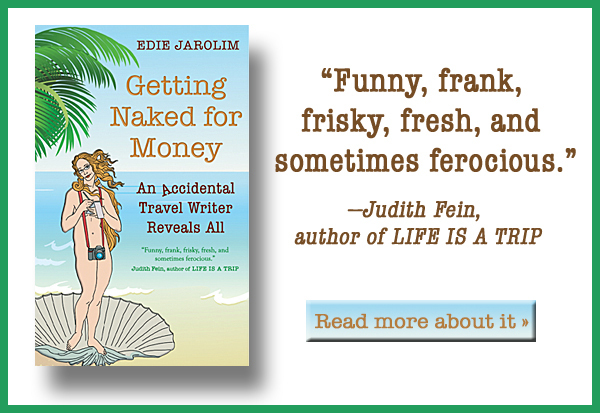 Edie, with your acumen, your unique turn of phrase and your admirably obsessive research, it’s no surprise to me that your blog has survived. But WHAT A LOT OF WORK!! Congratulations…and I don’t say these things because you’re my best friend (you know I’m not that nice).